Dromroe Village is an attractive apartment style complex, bordering the Mill stream and overlooking the Shannon river, near the main campus. It offers apartments to sleep 6, with large bedrooms, all with ensuite facilities. It is ideal for senior students who want more space and a serious study environment. First years can apply to live in Dromroe too.We also offer rooms for students with impaired mobility and apartments suitable for families. Number of rooms - 465. 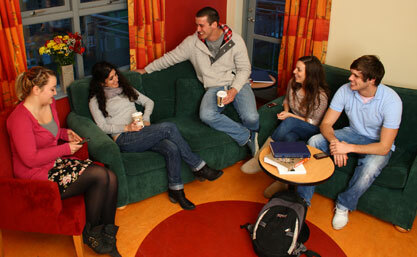 All villages have a mix of students in the community, first year, seniors, international students and postgraduate students. To view a campus map click here. Dromroe Village is a pedestrian village and vehicle access is not permitted. Residents can park in the Western Cark Park or the Foundation Car Park, however spaces are not guaranteed or reserved for residents. Car parking permits will not be issued to any Dromroe Village Residents. Dromroe Village is a non-smoking residence.